(Bloomberg) -- Morgan Stanley, which runs the world’s third-largest private bank, expects healthy growth in its Asian wealth operations this year, fueled in part by business from dealmakers and entrepreneurs in China’s smaller cities. The New York-based bank is seeing rising demand for its wealth management services from the emerging rich in China’s second-tier cities like Xiamen, Fuzhou and Dongguan, said Vincent Chui, who heads Morgan Stanley’s wealth operations in Asia. Many are entrepreneurs cashing out of their businesses and seeking help investing the proceeds overseas, he added. 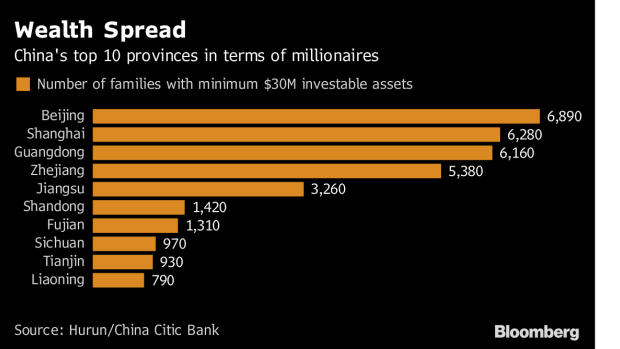 China has been minting billionaires at a faster rate than the U.S., drawing the attention of private bankers at firms like Morgan Stanley, UBS Group AG and Credit Suisse Group AG. The U.S. bank has teams in Singapore and Hong Kong dedicated to managing the offshore wealth of Chinese clients. In the past, China’s billionaires came mostly from established cities like Beijing, Shanghai and Guangzhou. One example of the growing wealth in the second-tier cities comes from Xiamen, in Fujian province, where Cai Wengsheng and Wu Xinhong became billionaires after listing their beauty-enhancing selfie app company Meitu Inc. in Hong Kong. Morgan Stanley targets wealth clients who are “active” owners of businesses or assets, Chui said. They are more likely to seek help with transactions such as listing their companies overseas or hedging their international portfolios, thereby allowing the bank to cross-sell them its investment banking and other services, Chui added. Beyond China, Morgan Stanley is getting more wealth management business from rich people in Thailand, the Philippines and Singapore, Chui said. The bank’s wealth assets in Asia rose at a double-digit pace last year, and may exceed that rate in 2018, he said. Morgan Stanley is placed seventh among Asia’s 20 largest private banks, according to publication Asian Private Banker, which put its Asian assets under management at $102 billion last year. Chui said he expects headcount to rise by 15 percent to 20 percent this year in Singapore and Hong Kong, as he adds relationship managers to serve new clients across the region. That would add to the roughly 100 RMs which Morgan Stanley had in Asia last year. UBS and Bank of America Corp. run the world’s largest private banks, followed by Morgan Stanley, according to the Scorpio Partnership. It put Morgan Stanley’s total assets under management at $1.95 trillion last year. --With assistance from Jun Luo.